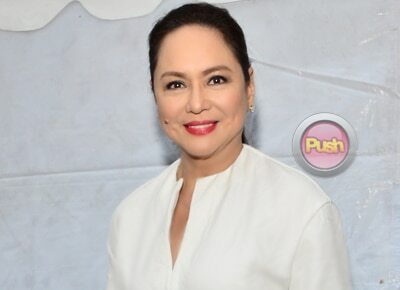 Charo Santos-Concio has made her big film acting comeback in the Lav Diaz masterpiece Ang Babaeng Humayo, currently competing for the Golden Lion in the 73rd Venice International Film Festival. But while the milestone is indeed a cause for celebration, given that Charo Santos-Concio, the actress is back, she was the dutiful artist wanting only the best portrayal of an engrossing role. And, since it has been over a decade since she last appeared in a film and, she admitted to PUSH in an exclusive interview that she did not mind going “back to basics”. After reading the script and accepting the lead role of Horacia, a sixtysomething correctional inmate who spent half of her life in jail for a crime she did not commit, Charo admits she had mixed feelings. “Syempre di ba natutuwa ako, pero natatakot din ako because I have not acted for the past…more or less 15 years. May takot, may kaba, may excitement—mixed feelings,” she said. But to effectively portray the character, not only were workshops necessary but also getting immersed into it, she said. Charo said she spent a great deal of time inside the Correctional Institution for Women in Mandaluyong City. “I interviewed several women inmates there, I talked to them about their life in prison. Kasi I had to imagine eh, anong nawala sa akin,” she said. “Kinausap ko sila kung paano yung buhay sa loob, no…na parang tumitigil ang mundo para sayo. Then I toured the premises. I wanted to have a feel on what it’s like to be in prison,” she added. Charo’s character, Horacia Somorostro was framed by an ex-lover and wrongfully convicted to serve a life sentence. After 30 years languishing in prison, she was set free after a friend and fellow inmate admitted to the crime after being guilt-trodden over Horacia’s plight. While she sought redress and revenge from the man who took away 30 years of her life, Horacia would find peace and solace in her belated journey to redemption. With Charo in the cast are John Lloyd Cruz, Michael de Mesa, Nonie Buencamino and Shamaine Buencamino.